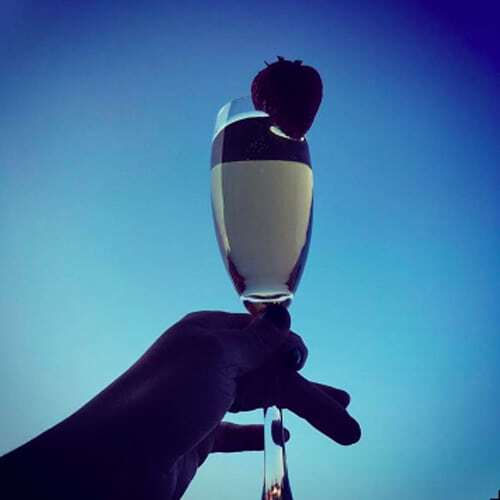 This week GHG investigates the idea of having her own personal Prosecco van. Think of the options – you could ask your dd to drive around in it and stop for bubbles when ever you felt a bit dry. Or just have one curb crawl you whilst having a Sunday afternoon stroll. 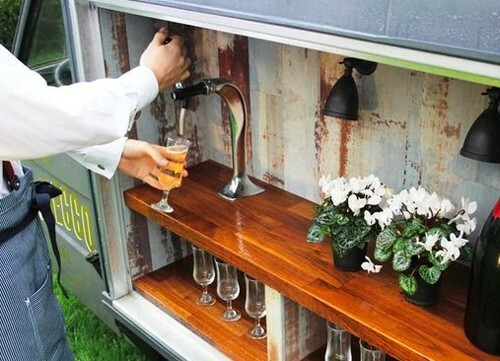 Things to do with a Prosecco van! Order one to turn up at your hen party picnic. Sip on bubbles while creating flower crowns or fascinators at your hen party activity. Delight your wedding guests and park one at the front of the church/sinagogue/tipi. 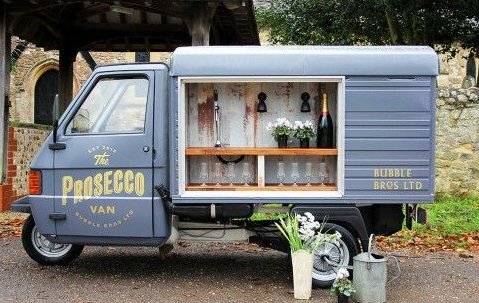 The Bubble Bros prosecco van is a 3-wheeled piaggio ape that has been lovingly converted into a sparkling wine bar and prosecco wagon. In a previous life, Ben and Joe worked long hours together in a London advertising agency. To escape the monotony of their Madmen lives they would spend their summers attending as many festivals as they possibly could. As fellow lovers of all things bubbly, and seeing the opportunity to do something a little different. Ben & Joe went into business & The Bubble Bros were born. Girls after my own heart! 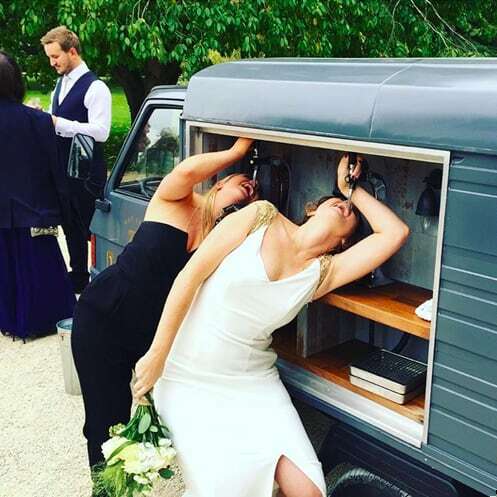 I love that this bride and her bridesmaid are having so much fun with the prosecco van. It’s the prefect addition to a sunny summer wedding. If I’d had one at my wedding I’m pretty sure my friends would have been planning ways to car-jack this van. Prosecco vans replace red buses in London (Not really true). Cheers lovely ladies, here’s to Prosecco vans taking the same route as a red bus. If you could please stop at the C2 bus stop outside Kentish Town tube on Saturday morning at 11 am. I can have a quick glass on the way into town and my journey will take on a rosy glow! If you’re looking for wedding ideas or hen party ideas check out Bubble Bros. Others may have copied this idea but Bubble Bros are the originals and therefore the ones that care the most. With excellent customer service and very nice looking guys running the company why would you look anywhere else?! For more fabulous hen party activity ideas click here. 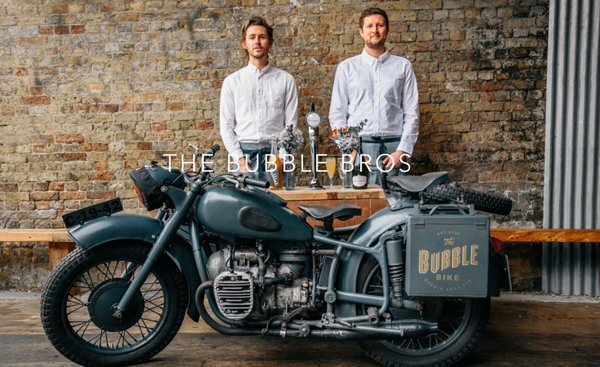 For The Bubbble Bros Prosecco van click here.